3T MRI is 100% sensitive for finding breast cancer and is generally better for all other MRI studies. A 3T MRI scanner shows details that no other scanner can see. Just today, a case where there was old healed tendonitis was able to be seen. This is something that could still be painful but would not be visible on any other scanner. 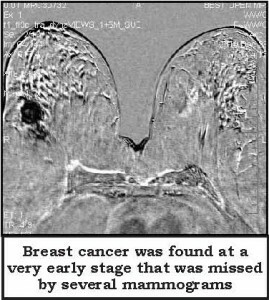 On a different patient, breast cancer was found at a very early stage that was missed by several mammograms. In the cervical and lumbar spine, scans are done with thinner sections and more detail than other scanners in Delaware – 2.5mm contiguous images. Herniations that are missed by other, less powerful, scanners can be found. Most people do “3mm skip 1mm” the scanner “skips” 25% of the anatomy scanned. Stronger means both sharper and faster! Twice as good! Offering state of the art MRI and many procedures that other providers may not offer – routinely including Diffusion Tensor imaging (DTI), which shows fiber tracts in the brain and spinal cord and picks up brain damage not seen by any other test. [We are unaware of anyone else doing this] We do metal subtraction imaging, non-contrast angiography with NATIVE, cancer screening with REVEAL. We add these innovative scans for free once your doctor orders a regular MRI of that body part. And all of this involves very little additional time on the scanner. At an October 2012 conference in Montreal, the doctors talked about the BEST MRI scan for a patient with a brain tumor. They said “routine imaging” should be done — which is what Medicare pays for. MRI Consultants offers these techniques and will do them for FREE when asked by your neurosurgeon or neurologist. Patients should know that 3T Breast MRI is best but we also have the best OPEN MRI at 1.5T. Scanned were two patients that did not fit at two different top facilities located in Delaware. What is quite remarkable is that both had mammograms and sonograms that were difficult to interpret. Neither knew if they had cancer. Neither fit in any other facility’s MRI at that time. The tests were also able to be shortened to a mere 12 minutes with the safest MR dye injection in the world. We spent extra money on contrast to offer the safest MRI contrast available. Both studies were positive for breast cancer (quite large, in fact) and both could have been found earlier if their doctors had ordered the test earlier. Missed by mammogram. SPEED. 3T MRI is the highest magnet strength for MRI in clinical practice. We have two 3T MRI scanners. We are happy that some doctors (or businessmen) have followed our lead. Our 32-channel head coil is twice as fast as a 16-channel head coil. COMFORT. Our 70 cm (30 inch) OPEN BORE scanner is more open than a traditional “open” MRI with a 0.3T scanner—which is only 19 inches wide. The so-called standup MRI scanner with a 0.6T magnet is only 18 inches wide. The 30 inches wide OPEN MRI we have (the most spacious in the world) has a weight limit of 550 pounds. It is the best MRI for anyone. 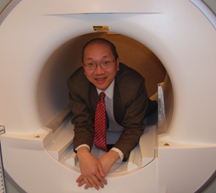 We have many patients who are claustrophobic on other MRI scanners who can be scanned without sedation at our facility. You have not had a comfortable MRI scan till you try our Siemens 18 channel Espree. When you have more room inside you are likely to hold still and get a better study. We also have a special sequence called BLADE which freezes motion. So if you are moving a lot we use BLADE for your scan and get clear pictures. ADVANCED SOFTWARE. DTI, DWI, SWI and NATIVE are just four examples of the advanced software available at our facility. DWI helps us to detect and characterize cancers in the body, which is very useful in finding liver, pancreas and kidney cancers. This advanced technique spares patients from unnecessary radiation, as MRI does not use ionizing radiation. SWI is a technique, which finds microscopic blood and calcification in the brain. We use this when you have had brain trauma and have seizures, memory loss or unexplained headaches. Without this software, other scanners would simply not see the lesion. Your brain can have many lesions not seen by other scanners. REVEAL technique, which shows us your arteries without any dye injection. It works very well in the legs and abdomen and pelvis. It shows us the arteries just by using the pulsations of your arteries. It is a very advanced technique and it is quite possible your doctor might be unaware of its existence. However, you can avoid an injection of dye, by asking your doctor to request REVEAL. SAFETY. But if your scan does require dye injection, the MR contrasts we use have never caused a single case of nephrogenic systemic sclerosis. This is not true of all MR contrast. We use Prohance at 3T and Multihance at 1.5T and Eovist if the patients have poor renal function. Consult our website at www.safecontrast.com . We believe using the safest contrast for MRI is the best solution for all of our patients. One size or contrast does not fit all. Safe contrast costs just a bit more, but you are worth it. ← Previous Story It’s Never Too Late! Next Story → Let’s Talk About Incontinence And Discuss Solutions That Work!